Making friends when we are older is tough. Making mom friends can be particularly hard if you don’t find the ones who are on the same wavelength as you are. And it’s important that we find our tribe, make mistakes, keep the ones who support us and gently leave behind the ones who aren’t a good fit. Here’s the thing. Unless we learn from our errors, the past has no value. It is just going to be a repetitive train wreck where we crash into our mistakes, pick up, dust ourselves off and go careening down that same track all over again. However, what if we had someone to help us out? What if that person talks you down from a cliff of indecision? What if she reaches out and gives you a hug to say that things may look bleak now, but they are certain to look up very soon? How many of us can say that we have that one person? I am not talking about your spouse or your significant other. In no way am I discounting the presence and importance of that person in your life. But, sometimes, we just need our girlfriends , don’t you agree? It gives me a specially warm feeling to admit that I have not one or two such persons, but nearly 30 women I can reach out to, on any given day. Sounds surprising, I know. A very close-knit online community that I moderate has some incredible mom friends, those who will jump to the rescue of every other member on that group. The most interesting part of this is the fact that less than half of us have met face to face and just once in the last 6 months! What, then, are the lessons that these incredible Mom Friends taught me? Do you know how incredibly hard this one is to follow? The minute you see a toddler throw a raging tantrum in the middle of a supermarket floor, don’t you grit your teeth and feel annoyed? Oh yeah! That’s it. No finger-pointing, no shaking of the head in a superior manner and definitely no shaming or criticism happen on this group. Ever. Suffice to say, that has extended to circles outside our group as well now. Parenting is hard. Let’s not even begin to mask that under the pretence of happy Facebook photos and cheery status updates. As a friend of mine said to me, ‘What you see on Facebook or Pinterest is what I like to call ‘Curated Parenting.’ The implication is that if you steer clear of talking about your guilt, your anger,your depression and keep focusing on the joys of life and the beauty that is motherhood, then you’re set for life. Um, no…Sorry. That doesn’t work for me. I am human, like everyone else. I have yelled, screamed, thrown a tantrum, even as recently as a few weeks ago. I shouldn’t be made to feel guilty. What I need is support, empathy and cartloads of love. With time, I have come out of that crushing burden of guilt and learnt to accept that it is okay to feel anything under the sun. For that, my mom friends are whom I need to thank. 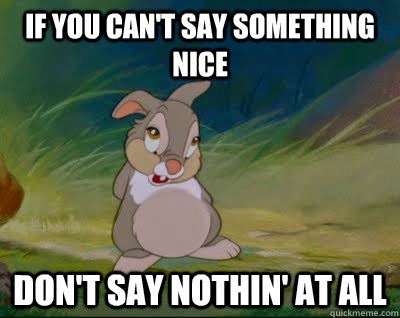 Be Nice and if you can’t do that, Say nothing! We are all so ready and easy with our advice and opinions these days. Or maybe that is a human mindset, to give advice or criticise even when it is not sought? Every single day, I now start with my mantra from my guide: WATCH- Watch your Words, Actions, Thoughts, Character and Heart. It is very tempting to jump in and be mean to someone because they disagree with you. But, it just takes a pinch of effort to hold back and say nothing at all. Try it, if you haven’t already. It’s worth it. Without going into the discussion about altruism and the motives behind it, let me just say that doing something nice for another human being is one of the most wonderful things you can do. I was in a pretty bad state a couple of months ago. Worry, stress and tension had caught up with me, spiralling me downwards into this infested pit of sadness. Absolute desperation made me share this on my group. Every single person there reached out to me. Two days later, although I felt marginally better, I was still feeling blue. 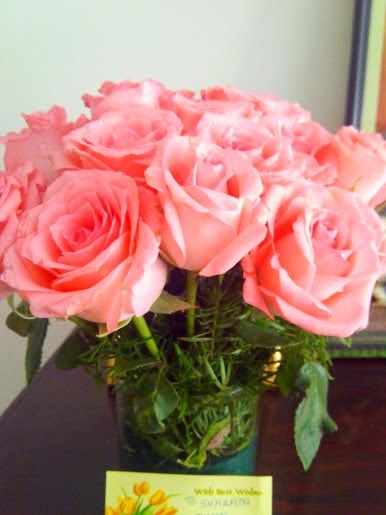 There was a knock on the door and I opened it to see this delicious bouquet of pink roses, sent specifically to cheer me up. Did you know this fact about pink roses? and can also be used as an expression of sympathy. Did I not know these lessons already? Did I need my friends to teach me any of this? Let’s just say it doesn’t hurt to have daily reminders of the things that matter. At the end of the day, you and I, we’re just the same and we are on the same journey. It’s just that our paths to get there, may be slightly different. A thoughtful post, Shailaja. Difficult, very difficult to stay non-judgmental and to let go of one's insecurities, fears, anger, guilt and all such things. But parent or non-parent, we all have to do it if we want to stay sane and not be caught up in a vicious cycle of frustration and overwhelming emotional chaos. Living in the present moment and appreciating every little thing is what life is all about, Shailaja! 🙂 While we know this, it often takes a lifetime to learn it. Some people consider being judgmental their birthright. We simply have to develop the tolerance to let it in one ear and out the other and ignore….because – there's so much more to feel happy about. Good to know you're recovering quickly. Love and hugs…and may the coming year be your best ever! A community of close knit and like minded people is a blessing! Doing kind deeds for another… I love that. I believe that what goes around, comes around. So, I believe in keeping my circle positive. Love those flowers… very thoughtful and beautiful gesture indeed! Be kind to oneself, seriously! I don't know why does it take so much reminding to remember this one. It is ok to average and not the SuperMom that everyonw seems to be. And Let go… let it go. No one is perfect. Also, we can't live alone. We need support. You caught the essence of the group Shailaja. Motherhood is such a wonderful connecting factor. Only when you become a mom can you understand the challenges that come with it – how seemingly trivial things can completely upset your mental balance, why you overreact, why you worry yourself sick over a seemingly small cough. Being part of the group puts things in perspective and that helps immensely. Loved your post and thank you for TP.